​Most people think about feeding their plants in terms of N-P-K (Nitrogen, Phosphorus, and Potassium). While it is true that simply applying N-P-K loaded synthetic fertilizers is an inexpensive way to give your plants a “sugar high” and may yield results, there are a number of reasons why it is an inferior and possibly damaging way to treat your soil, plants, and environment. If we fed you the prisoner’s diet of only bread and water, it is true that you would stay alive, however, would you be properly nourished and would your body be able to fend off disease and grow to your maximum potential? Of course, the answer is “NO”, and neither will your plants if all you do is focus on N-P-K applications of synthetic fertilizers. Our Proprietary and All Natural SF-Organics Fertilizer Program delivers much more than N-P-K, providing everything your soil and plants need for maximum growth, yield, and hardiness. SF-Organics is uniquely processed as to carefully preserve the natural enzymes, quickly breaking down the fish protein into small chain amino acids and peptides. Natural chelates are also created within the hydrolysate, making trace minerals including iron, copper, zinc, sulfur, magnesium and calcium easily soluble for plants and turf. SF-Organics full nutrition feeding Protocol provides a Full Complement of macro and micro-nutrients, trace elements, minerals, amino acids, peptides, proteins, calcium, enzymes, all in a useable form perfectly suited for maximum efficiency of uptake for your plants and turf grasses. Our all natural Nitrogen from Fish is the most plant and soil friendly composition, in a form that is readily usable as soon as you apply it. Other fertilizers have barely half of their Nitrogen in a plant usable form, this means almost 50% immediately is lost to pollution causing run-off and is absolutely ruinous to the environment! This wastes your valuable money, deprives your plants of needed nutrition, and harms your surroundings. Nitrogen applied in this efficient sustained release and plant-friendly form lasts longer! Other fertilizers provide an immediate blast but are washed away and used up in just a few days. SF-Organics is delivered in the form that can penetrate the soil and remain there providing sustained-release nourishment for up to 15 weeks! With natural organic fertilizer, you are providing maximum benefit to your plants and your soil, because healthy soil is alive with beneficial microorganisms and SF-Organics Fish Fertilizer provides for them too. Healthy soil yields healthy plants. ​Be Cautious when viewing N-P-K ratings! Although our N-P-K rating appears lower than synthetic alternatives, your plants actually get more nitrogen. Synthetic nitrogen is water-soluble; so what isn’t immediately absorbed by plants simply runs off into groundwater, streams, and lakes. If too much synthetic nitrogen is applied, it will burn leaf and root tissue. The nutrients in SF-Organics Fish Fertilizer remain accessible as amino acid and peptide solids in the soil and are held in the root zone and allowed to break down naturally – providing maximum benefit to the soil structure and root zone of your plants and turf grasses. This prolonged and steady release of nutrients keeps plants greener longer and builds stronger resistance to disease. It also results in greater efficiency. An application of one part fertilizer to 25 parts water should provide enough nourishment for any crop or turf to flourish. But feel free to apply as much as you like –as often as you like, our all-natural fertilizer is non-burning. SF-Organics Liquid Fish is a super concentrate. Only mix the amount to be used today, and definitely use all that you mix. Do not worry, you CANNOT over-apply! Remember to rinse your sprayer thoroughly after each use. Spray on lawn using 4 oz. SF-Organics Liquid Fish per gallon of water. Apply 4 oz. SF-Organics Liquid Fish per every 500 sq. ft. of lawn area. For best results, Spray in the early morning or late afternoon. If using our pre-set hose end sprayer, simply fill with product, attach to your hose, and turn on the water and spray. The application can begin in the spring after the last frost ends. Apply every 2-6 weeks throughout the growing season. You can adjust according to your individual preferences, generally, more applications will equal more robust growth and vibrant color. NOTE: DO NOT STORE DILUTED SOLUTION! SF-Organics has a shelf life of 4 + years, however, once water is added, it acts as the catalyst to stimulate the spectacular microbial growth and must be applied in full immediately. ​Mix 4 oz. SF-Organics Liquid Fish Fertilizer per gallon of water. Using a hose end sprayer or simple watering can, apply directly to leaves and flowers until runoff occurs. Apply in the early morning or at sunset for best results. Apply every 2-4 weeks throughout the growing season. ​Mix 6-8 oz. SF-Organics Liquid Fish Fertilizer per gallon of water and apply monthly during the growing season. Apply liberally on leaves until runoff occurs. For general tree care, newly planted trees or shrubs mix 4 oz of SF-Organics per gallon of water and apply to the soil at planting. ​Mix 4 oz. SF-Organics Liquid Fish Fertilizer per gallon of water. Dip plants into solution just prior to planting. What is considered "Biological Farming"? "Biological Farming" ​us when farmers take a deeper interest in not only what they're growing but how it grows as well. The soil, bacteria, fungi, roots, and plants live symbiotically - each needs the other to sustain itself - "Biological Farmers" know to use products that enhance and help sustain. How is it hurting me to use chemical fertilizers, pesticides and herbicides? As plants are living organisms; so is the soil that the plants derive their life from - by providing the soil with chemicals, pesticides and herbicides instead of natural alternatives you damage the soil in the long-term by giving it a quick "pick-me-up" that lasts for a very short period and then you need to apply even more in order to try and negate the damage that's constantly compounded. What are the short/long term benefits of "Bilogicals" vs "Chemicals"
Biological's = Start with and amount and decrease throughout the ears as your soil/plant-life is restored and able to sustain itself. Chemicals = Start with an amount and increase thought the years as our soil/plant life is continually harmed and destroyed. "Biologicals" short-term will show marked improvement in soil biology. soil health, plant health, and plant biology (darker leaves, bigger blooms, drought resistance, less curl-back on leaves etc.). Long-term they show an increase in biology life. sustainability, and weed/pest control (weed/pest tend to gravitate towards deficient soil). As well as huge increase in root development, organic matter (richer soil), balanced ph, etc. How do I know which products to use for my soil-types? All soil-types will require different nutrition/mineral basis as well as different products based on your soil type. A soil-test should be done YEARLY to ensure proper use of products. Each year is different on pH, absorption of nutrients, water, etc. Is special equipment necessary to get into sustainable, organic growing? No, all or many products can be used with the equipment you already have. Irrigators, greenhouse drip lines, composting set-ups, etc. Is there a market for Organic Farmers/Growers? Yes, The Organics Market has seen over 150% increase in consumers within the past ten years - there is almost no limit to how much organic/natural product can be sold as long the quality is there. 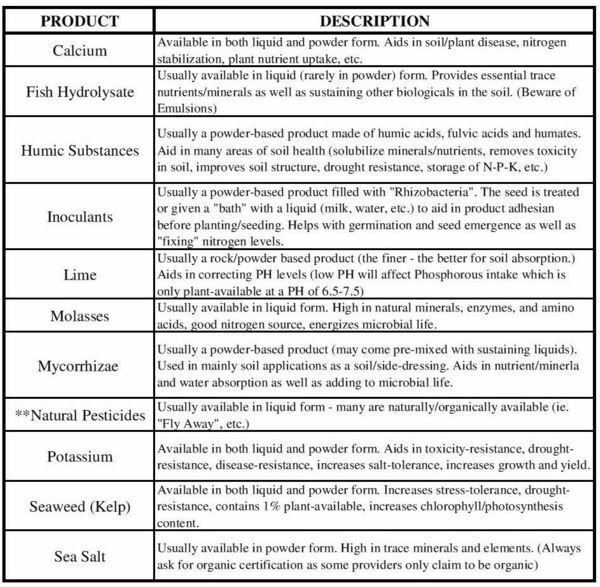 What are the main biological products available on the market right now? There are many different types of product available. A list of well know product and effects are below.